Well, these modules came pre-packaged in a anti-static shielding bag, so we don’t usually test each one of them (and that would also be impractical), but we do sample test them. Yup, I measured the resistors after removing them from the PCB. 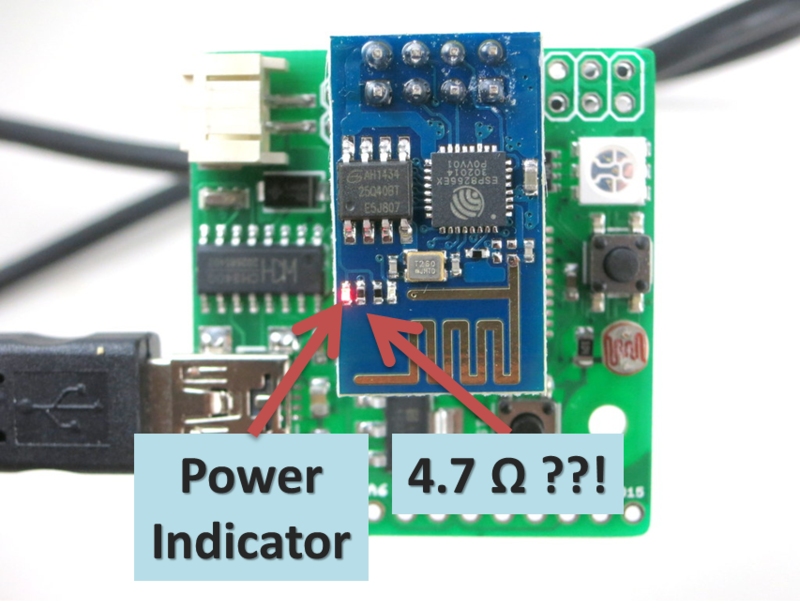 Have you had any issues with ESP8266-1 modules getting hot like lava that had the correct resistors fitted? I have a couple of them that, when run in “CIPMODE=3”, pull a constant 200mA, no matter if data goes in our out & are “crash happy” and need a hardware reset all the time. I could get them to a more or less usable state by using “CIPMODE=1”, but I still have a feeling that something is not quite right (current down to about 150mA, less heat). A representative of espressif suggested I had either an antenna mismatch problem or power supply issues. I don’t think the latter is the case (regulated supply is pretty much a flat line). As for the antenna mismatch, that might be the case, but to me all those modules look like clones to me, so I guess either all of them are bad, or none – as far as the layout goes. How hot or warm do your modules get during sending / idle? Mine get so hot, that placing a finger onto the chip is very painful. Trying to decide if moving to a different ESP8266 module would be the way to go. I’d try one with an on-board chip-antenna. I have a ESP8266-1 , which stopped working and I cant install a boot loader in it. It also seems to get hot snf I could not communicate with it. I did some tests & found that the RX line is shorted to Ground somewhere under the ESP8266/MCU (not under the EEPROM which I could remove OK. Removing the 8266/MCU is just too hard, so in the bin it goes. I have managed to burn 4 ESP8266 on a dev. board (https://github.com/nodemcu/nodemcu-devkit-v1.0), and the reason is still unknown for me. – 3rd I removed the ADC In setting (analogRead) from my code, even if I don`t use it for anything, yet. 220V AC -> Power transformer from 220 to 6V (AC) -> Rectifier bridge (Vout ~8.6V DC) -> 2 capacitors (470uF + 100nF) -> LM7805 -> Power the ESPshield to Pin 15 (+) and Pin 7 (-) -> use Pin8/GPIO14 as an output to power an opto-triac MOC3041 (current was limited to 7.6mA using a 270ohm resistor) ->a triac to drive a load of 21W (7 x AC LED lamp) -> Pin1/GPIO16 used as an input (if pin state is changed than also the output is changed). After running the application ~15 minutes (Playing on/off via web requests) I have played also a little bit with the input pin and everything worked as expected. Then I have decided to let lamps ON (input pin was pulled to GND – Red led from shield lit), but after ~5 -10 minute the lamps turned off (Red led from shield remained on) and now the 4th ESP is dead. I have checked the value of current limiting resistor for the Red Led (470 ohm, value was obtained after I have removed the resistor from the shield) and from my calculations the current ~3.2mA is small enough not to damage the ESP, and now I have no idea what I`m doing wrong. Have anyone an idea that can help me with this issue? Since this sounds like a hardware problem, you will need to show your circuit schematic in order for someone to help you diagnose the issue.